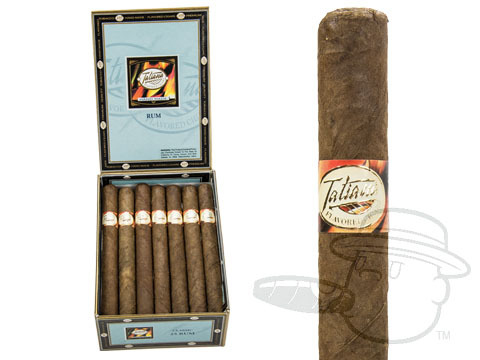 Tatiana Classic Rum carries the essence of the islands through a traditional 6x44 Lonsdale vitola. Didn't like this too much. Flavor was stale and did not taste anything like I expected. Harsh aftertaste left me wanting to brush my tongue! I have been smoking this brand of rum flavored cigars now for over 2 years. I've tried many different cigar brands over the years and none of them come close to the taste, aroma and price. Great Cigar, Tatiana! OK cigar. I thought it was a little pricey for a flavored cigar but I enjoyed it. These cigars are not bad. They did seem a little hard packed, so I had to massage them a little to get them to draw a easier. The rum flavor wasn’t what I expected, it was a little artificial. All-in-all, I’m not sure I would buy them again, but I may try a different flavor. Very nice from open through the first five minutes. After that, I'm uncomfortable with the 'medium-bodied' designation. Tatiana Classic Rum is rated 4.1 out of 5 based on 13 customer ratings.